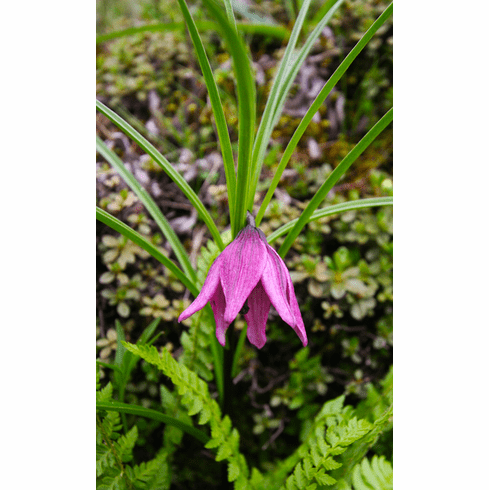 This rare color form of L. nanum' shows up from time to time on specialty nursery bulb and seed lists and can vary from blue-violet to bluish to near violet. As with L. nanum this variant can also be a very unforgiving lily under cultivation with a bad habit of dying for no apparent reason. Long time species enthusiast Edward MrRae was commonly heard saying "To successfully grow L. nanum, you need to live in Scotland". Title photograph in natural habitat by Mr. Sonam Wangchen who operates 'Bhutan Excursions. 'Bhutan Excursions and can be reached at www.bhutantour.bt for those wishing to see this rare and delicate beauty in person. What Mr. Wangchen and his tours members see in person is that of which most of us can only dream. Photo copyright Mr. Sonam Wangchen, Bhutan Excursions, all rights reserved. Used with permission. Photo inserts 1, 2, and 3 taken by Yijia Wang in habitat. Yijia does offer seed of several Chinese Alpines at his nursery as www.canursery.com as well as seed of other native plants from the alpine regions of China.